Semi-automatic pistols designed by the U. S. small arms genius, John M. Browning, and produced in Belgium by Fabrique Nationale (F.N.) have an enviable reputation for simplicity, strength, and reliability. Millions of Browning pistols were produced through the years, and F. N. still manufactures them in various models and calibers. Among the most popular Browning pistols was the Model 1910 offered in cals. .32 ACP and .380 ACP. Of simple blowback design, this compact pocket arm was an immediate success, and a great many were sold. In 1954 the Browning Arms Co. introduced a cal. .380 ACP version of this pistol in the U. S. where it was offered for many years as the "Browning .380 Caliber Automatic Pistol". This pocket arm failed to meet requirements of the point system of the Fed eral Gun Control Act of 1968, and it was redesigned to qualify for importation under the 1968 regulations. Called the Browning .380 Pistol, the redesigned version introduced in 1971 is basically the same in mechanical design as its predecessor and is chambered for the cal. .380 ACP cartridge. This redesigned pistol has a 4-7/16" barrel and weighs 23 ozs. unloaded. Its combined overall length and height exceed 10" as required by import regulations, and it is fitted with target-style sights. 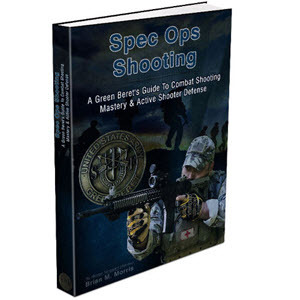 The fully-adjustable rear sight has a wide square notch, while the square-top front sight, which is sloped off at the rear to prevent catching on a holster, is wide and easily seen. In addition to a thumb-operated safety on the left side of the frame, the Browning .380 has a grip safety, magazine disconnector to prevent firing when the magazine is removed, and a signal pin which extends rearward through a hole in the frame when the firing pin is cocked. Another safety feature is provided by the extractor which projects slightly from the slide to signal the presence of a cartridge in the chamber. The six-round magazine of this pistol is detached by pressing a magazine latch at the bottom of the frame. Extending from the lower front of the magazine is a curved extension which serves as a finger rest and facilitates magazine removal. The checkered black plastic grips are held to the frame by a single screw, and the left grip has an integral thumb rest. ITo field-strip the Browning .380, remove and unload the magazine (38). Replace the magazine, and draw the slide (19) fully to the rear. Then, check to see that the chamber is empty. Pull the trigger and engage the safety (31). Use a tool to force the slide ring (1) rearward, and rotate Va turn. Hold the slide ring tightly and ease it out of the slide. (Removal and replacement of the slide ring is aided by use of a spanner tool fitted to the index cuts. The tool shown was made from a thin-bladed putty knife.) Remove the recoil spring while turning it counterclockwise as viewed from the muzzle. 2 Remove the magazine. Release the safety and pull the slide back until the safety can be raised into the forward slide notch. Turn the barrel (17) to the right (viewed from the rear) as far as it will go. Release the safety and move the slide forward off the frame (34). Withdraw the firing pin and signal pin with springs (13) (14) (15) (16) from the rear of the slide. Turn the barrel fully to the left and remove through the front of the slide. This completes field-stripping for normal cleaning. 3 If necessary to disassemble further, rotate the safety upward and withdraw the safety and safety spring (32) to the left. Unscrew and remove the grip plate screw (25), and remove the grips (20) (26). Push out the grip safety pin (33) to release the grip safety (37), sear spring (36), and magazine latch (35). Push out the magazine safety pin, and remove the magazine safety (24), taking care to avoid loss of its spring (23). In reassembling these parts, seat the large end coil of the spring in the recess at the front of the magazine safety. 4 Push out the sear pin (27) and withdraw the sear (22\ through the rear of the frame. Slide the connector (21) rearward, and lift it out of the frame grooves. After the trigger pin (28) has been driven out, the trigger can be rotated forward and removed through the guard. 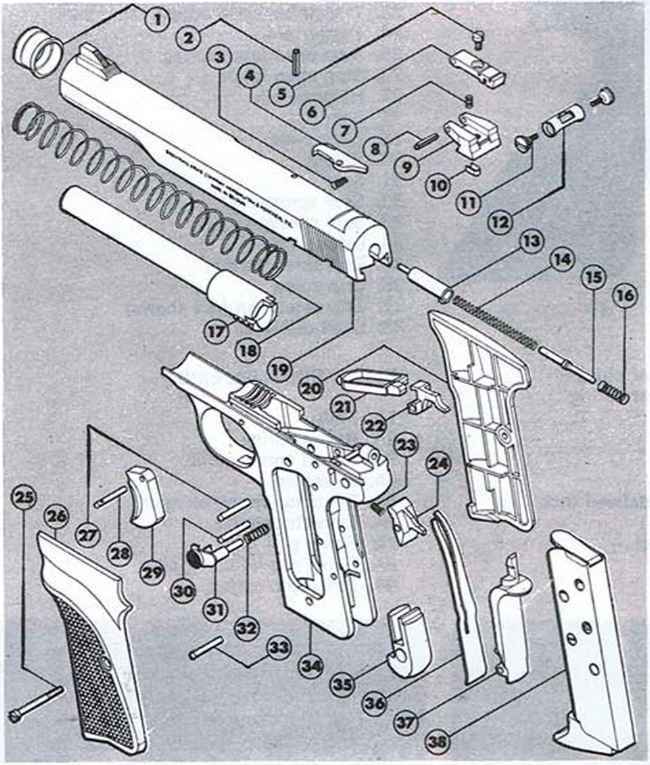 5 Reassemble the parts in the frame in reverse order, being careful to avoid deforming the magazine safety spring. 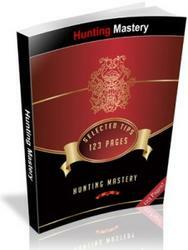 The pins for the sear, magazine safety, and grip safety are interchangeable. Install the sear spring with its hooked end seated in the groove at the front of the magazine latch cutout (arrow), split fingers contacting the connector and sear (arrows). The spring is tensioned by insertion of the grip safety. 6 In reassembling the barrel and slide, hold the slide upside down. Insert the barrel with its multiple lugs up, and move the barrel rearward until the lugs align with the recess opposite the front of the ejection port (arrow). Rotate the barrel fully to the right to move its lugs into the slide recess (arrow). The rest of the reassembly is the reverse of field-stripping. 7 Cutaway shows the relationship between the assembled parts. The pistol is shown cocked and unloaded and the safety is disengaged, but the sear is locked by the grip safety. Parts are number keyed to the parts legend. How remove magazine browning 1910? How to disassemble browning 1910 pistol? How to Disassemble a browning .380Caliber Handgun? How to strip a handgun? How to remove trigger browning 1910? How to replace sear in browning 1910? How to breakdown a Browning FN 22? How to clean a FN Browning model 1910 auto pistol 380 cal? How to clean eight 380 caliber Browning pistol? How to field strip a browning model 1910 380? How to brake down a browning 380? How to field strip a browning 380 pistol? How to disassemble a Browning 32 calibar 217070? How to dissasemble browning 1910 fn? How to field strip a ruger 380 model 1910? How to field clean browning 1910? How to disable browning 380 simi automatic? How to disassemble belgium browning pistols .380? How to clean browning 380 belgium made? How to break down 1910 browning semi auto pistol? How to diassemble a browning early model .380? How to break down a browning 380 pistol made in belgium? How to dismantel a browning 380? How to strip a old browning belgium 380 pistol? How to disassemble a browning belgium 9mm pistol? How do you reseal the barrel on a Browning model 1971 380. automatic pistol? What is the tool to disassemble the 380 auto handgun? How to remove bullets for a 380 handgun auto? How to reassemble a Browning 1910 380 handgun? How to dissamble a Browning model 1911 380 cal. pistol? How to disassemble a browning 380 caliber handgun? How to disamble a Browning 1910 .380 pistol? How to take apart vintage browning 380 pistol? How to reassemble browning 9mm automatic pistol? How to disassemble a browing pocket pistol? How do I breakdown a Browning a Belgium made Browning 380? Is a magazine from a browning1911 interchangeable with a 1910 brwning 380? How to fuly reassemble a belguim browning pistol? How t fild strip a browning 380 pistol? How to field strip browning model 1071 auto pistol? How to replace grip on browning 1911380 ACP hand gun? How to clean Broning side arms? How to field strip browing 380 pistol? How to change firing pin on the FN 1910 pistol? How to clean a browning 1911 380? Are magazines for pre 68& post 68 browning 380 auto interchangeable? HOW TO TAKE ARPAR A MAGAZINE ON A BROWNING 1910? How to stripe automatic pistol? How to break down and clean a 25 autimatic pistal? How to disassemble a browning short pistol? What does it take to switch calibers on a fn model 1910? How to disassemble browning 1911 380 acp? How to clean a browning 9mm handgun? How to disble cal 9mm Browning short? How to disable cal 9mm Browning short? How do disasemble for cleaning a pre 1968 Browning 380? 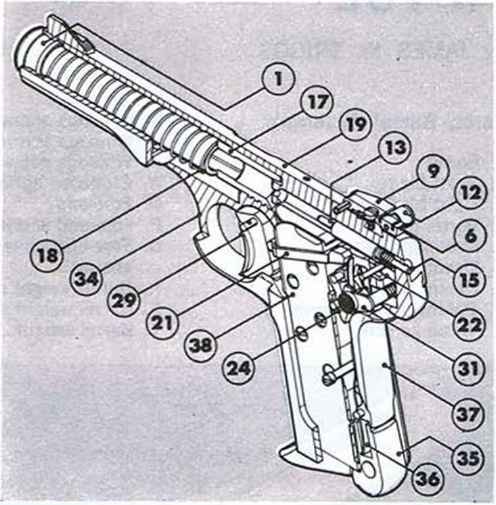 How to remove barrel on 389 browning pistol instructions? How to disassemble firing pin of a 380 fm pistol? How to dissasble a 1910fnpistol .380?